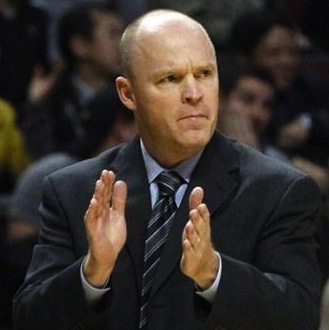 Here’s an awesome guest post from my good friend, Jay Santiago (he’s a lifelong San Antonio fan, but he was so impressed with Milwaukee’s Scott Skiles yesterday that he was just moved to write!). Check out how unorthodox, to say the least, Milwaukee rallied to beat Chicago – props to Skiles for the balls to make those tough choices in the second half! Today’s NBA headline: Bucks rally to beat Bulls 93-92. Yes, on an 8-game night with the Nets edging out the Knicks in OT during NYC’s first battle of the boroughs and the Thunder obliterating the overachieving Bobcats with a 45-point win (down from 53 at one point), we focus on the Rose-less Bulls taking on Wisconsin’s third most popular pro sports team (next to the Packers and Brewers, if you’re wondering). I know, quite underwhelming. But it gets better from here. In the first leg of a home-and-away series, Milwaukee lost to Chicago on its own floor two nights ago with lead star Brandon Jennings rolling his ankle late in the game. The Bulls were poised to get a two-game sweep of the Bucks tonight, and it looked in the bag shortly after halftime. The Chicago starters charged out of the gates to start the third, led by Richard Hamilton, who lit the board up for 30 points while being manned by Monta Ellis for much of three quarters. Chicago must have seen Ellis’ defensive ineptitude as a clear advantage; they continuously ran off-screen catch-and-shoot plays for Rip that had Ellis constantly a step late to challenge. The Bulls blew the game wide open, inflating a 10-point halftime lead to 27 with about 3 minute left in the third. At this point, Milwaukee coach Scott Skiles had seen enough, benching his dismal starters, who mustered a combined output of only 37 points by then. the Bucks rally for a road win in Chicago. Home team up 27 and road team fielding second stringers with a little over a quarter to play – it’s game over, right? That’s actually when the real game began – with great action all the way to the end. The Bucks bench quickly waxed hot with Benoh Udrih playmaking, and they made a 12-2 run to close the third. They were still down 17, but they continued to sizzle with a ridiculous 19-2 blitz in the first 5 minutes of the fourth. It was close the rest of the way, with both teams trading baskets relentlessly. Down 2 with under 2 minutes to play, the Bucks isolate Mike Dunleavy on the right wing, and he drives hard against Luol Deng to draw a double from Joakim Noah, who leaves Ersan Ilyasova momentarily open underneath. Dunleavy dishes a perfect bounce pass inside to Ilyasova, who converts on an and-one play for 3 of his team-high 18 points, giving Milwaukee a 91-90 lead. Hamilton and second year forward Ekpe Udoh trade baskets in the ensuing possessesion to set up a must-score situation for Chicago with under a minute to go. The Bulls go to Rip for a running jumper in the right lane, but he gets blocked by Udoh. Noah recovers for a put-back, but Udoh is there again for the stop! With 8.9 seconds left, the Bucks call timeout; it’s their game to win. Then comes the best moment of the game – just right after the timeout. Needing a good inbound pass and dead-shot free throw shooters, Skiles makes a bold decision to NOT bring Jennings and Ellis, arguably his biggest offensive threats and best shooters, in the game, and keeps the same five that have played the entire fourth quarter to get them the win. It was a gutsy, admirable call, one that could easily be criticized in hindsight if they were to muff the incoming free throws should Chicago foul. But it didn’t even come to that, with Chicago’s returning point guard Kirk Hinrich deflecting Dunleavy’s inbound pass to Udoh and giving possession back to the Bulls for the last shot. Hamilton gets the ball in the left corner, drives against unheralded rookie Doron Lamb for an inside jump shot, but Lamb stays close with in-your-face defense all the way, causing Rip to miss. Milwaukee pulls a rabbit out of the hat for the win! In as much as the stats and the storylines would credit this one to the Bucks bench, hats off to Scott Skiles for getting Milwaukee the victory. He was a mentor out there, giving his Bucks, the Bulls, and all of us some tough lessons in the fourth, especially during that last timeout. His lesson for the Bulls – to play for the entire 48 minutes because it ain’t over ‘til it’s over. His lesson for his bench – that hard work pays off, and that they’ll get playing time so long as they put in the effort and leave it all out on the court. And for his potential All-Stars – best player or not, they’ve got to earn the right to play just like everyone else with effort on both ends of the court. This was a high-risk high-return move that can affect his standing in the locker room if egos get in the way of growth, and his message is not seen in the right light. If, however, they do get it and build on the learning, then each player in the Bucks roster can be so much better than they were before this game. It’s a good thing, of course, Skiles and the Bucks actually WON the game; everything, after all, is always better, and easier to accept, with winning. 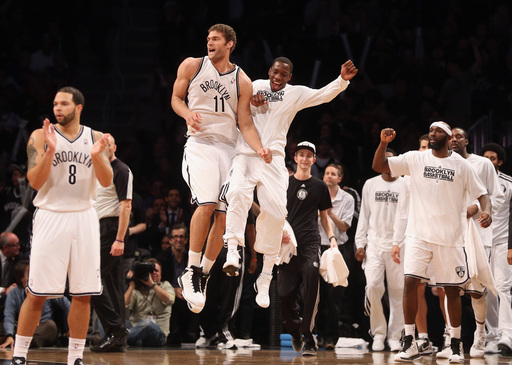 The first round of the battle of New York turned out to be well worth the wait for the new kids on the block. Behind double-doubles from Brook Lopez and Deron Williams, the Brooklyn Nets handed the New York Knicks a 96-89 overtime loss at an energized Barclays Center to take the inaugural matchup between the city rivals since the Nets crossed the Hudson River into their new home. The highly anticipated matchup was delayed more than three weeks by Hurricane Sandy, and the final outcome would be as well after the Knicks rallied back from a five-point deficit late in regulation. However, Brooklyn put forth a pivotal 7-0 run during overtime to gain early bragging rights as well as record its third consecutive victory. Lopez finished with 22 points and 11 rebounds, while Williams racked up 16 points and 14 assists to help the Nets move to 7-1 at the first-year Barclays Center. fellow NYC team -- the Knicks. Boris Diaw led a balanced San Antonio attack with 16 points as the Spurs kept the Washington Wizards winless on the season with a 118-92 pounding at Verizon Center. Tiago Splitter added 15 points and 12 rebounds, while Tony Parker also netted 15 points. Tim Duncan had 14, Gary Neal poured in 13, Manu Ginobili scored 12 and Matt Bonner finished with 11 for the Spurs, who have won four straight. Jordan Crawford paced the Wizards with 19 points and Kevin Seraphin dropped in 18 as Washington fell to 0-12 on the season, adding to the worst start in franchise history. Brandon Knight scored 26 points and Greg Monroe netted 20 with 10 rebounds, as the Detroit Pistons downed the Portland Trail Blazers, 108-101, at the Palace of Auburn Hills. Kyle Singler totaled 16 points, 10 rebounds and five assists, and was one of seven Pistons scoring in double figures in their first win against a Western Conference opponent this season. Detroit has four victories in its last seven games following a brutal 0-8 start. LaMarcus Aldridge, who sat out Sunday's loss to the Nets with a stiff back, led Portland with 32 points and 10 boards. Damian Lillard missed his first 12 shots from the field and finished with 12 points and seven assists in defeat. Ekpe Udoh's driving layup with 57.5 seconds remaining capped a furious second-half comeback that lifted the Milwaukee Bucks to a 93-92 decision over the Chicago Bulls at the United Center. Udoh finished with 11 points -- eight of which came after halftime -- while Ersan Ilyasova put up 17 of his team-best 18 points over the final two quarters to help the Bucks overcome a 27-point deficit late in the third period and end a string of nine consecutive losses to the Bulls. That included a 93-86 setback in Milwaukee in Saturday's opener of this home-and-home series. The Bucks trailed 78-51 with 2:50 remaining in the third quarter, then proceeded to outscore Chicago by a 42-14 count over the final 14-plus minutes. Richard Hamilton poured in 30 points and Carlos Boozer had 19 along with 11 rebounds for the Bulls, but Chicago shot a woeful 21.1 percent (4-for-19) in the fourth quarter to squander its sizeable lead. Zach Randolph posted 19 points and eight rebounds as the Memphis Grizzlies took an 84-78 victory over the Cleveland Cavaliers. Marc Gasol added 19 points and six rebounds, while Rudy Gay gave 15 and six for the Grizzlies, who have won 10 of their past 11 games. Anderson Varejao had a double-double with 15 points and 22 rebounds, while Dion Waiters added 15 points for the Cavaliers, who went 0-3 on a short road trip. Kevin Durant had 18 points, six rebounds and four assists in a little over two quarters of action as the Oklahoma City Thunder routed the Charlotte Bobcats, 114-69, at Chesapeake Energy Arena. Durant, along with the rest of the Thunder's starting lineup, sat out the majority of the second half after Oklahoma City had built an insurmountable lead. Thabo Sefolosha finished with 14 points and Russell Westbrook contributed 12 points and 11 assists before also exiting in the Thunder's second straight win. 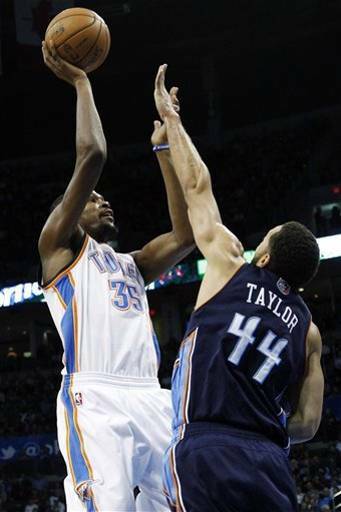 Hasheem Thabeet recorded a double-double with 13 points and 10 rebounds in a mop-up effort. Jeff Taylor was the lone member of the Bobcats to score in double digits with 10 points in Charlotte's largest loss since the team's inception in 2004. Derrick Favors made three big foul shots in the final 41.5 seconds to lift the Utah Jazz over the Denver Nuggets, 105-103. Favors ended with 19 points, seven rebounds and two blocks for the Jazz, who improved to 6-0 at home this season. Al Jefferson added 28 points. Kenneth Faried had 21 points and nine boards to pace the Nuggets, who had a four-game winning streak snapped. Ty Lawson donated 16 points and nine assists. Greivis Vasquez made five 3-pointers en route to 25 points, as the New Orleans Hornets snapped a seven-game skid with a 105-98 victory over the Los Angeles Clippers. Vasquez also dished out 10 assists and pulled down six rebounds for the Hornets, who won for the first time since Nov. 9. Ryan Anderson and Jason Smith added 17 points apiece. New Orleans shot 50.7 percent from the field and went 15-of-25 from beyond the arc. Clippers forward Caron Butler set a franchise record with nine 3-pointers. He went 12-of-24 from the field and 9-of-15 from beyond the arc for 33 points. Chris Paul donated 20 points, eight assists and four steals for Los Angeles, which has lost four in a row. Blake Griffin was limited to a career-low four points on 1-of-9 shooting. The Clippers went 18- of-37 from three-point range to set a club record for the most 3-pointers made in a game.